Yes, it's time we stopped apologizing. Great commercial. Selling... What, exactly? Nostalgia? Was that a car, or a new after-market accessory I can use my welfare or unemployment check on? What is it time we stopped apologizing for, exactly? The exporting of jobs overseas? The abandonment of land, infrastructure, economies, culture, societies, and entire cities? This was a great commercial, and whoever made it, and thought it was worth the millions of dollars to air during the commercial, should be flown to Detroit, drug through the streets, and shot. Figuratively speaking, I mean. It's sad that Detroit can't come up with a more credible spokesperson than Marshall Mathers. And what's all this "Detroit's coming back" stuff on "Detroit 1-8-7" which I am told is a crime code from Los Angeles, meaningless in Detroit. Wouldn't it be easier to fix Flint? Nostalgia? I'd say this is the most realistic car commercial I've ever seen. It actually shows the bombed out and abandoned sections of Detroit. It admits the city is struggling. And it dares to say that this experience might even improve Chrysler's ability to make good cars. You want nostalgia, watch one of the lame GM commercials filled with images of the company's glory days, images you have to be 60 years old, at least, to appreciate. I should add that this is a car commercial, the stuff of fantasy, so the "realism" I found in this one is relative. I liked it. I think it will help to sell cars. The folks at FIAT-Chrysler must be very happy to have gotten such buzz, over and above the first-run impact. Damn straight. This made my day. This commercial got me fired up. Sometimes I think all we've got left in Detroit is the street cred — often unwarranted — that comes from living in Detroit. Hey, if that's what we've got, let's use it! I think that's what the commercial is trying to get across. Detroit's always had style, despite (or because) of its problems. Let's not ignore that. Let's embrace it. Then again, I was kind of drunk when I saw it. Those Super Bowls just last forever. The reality is that most TV critics are saying the Eminem/Chrysler commercial was easily one of the best commercials of the year and works on a lot of levels. Chrysler hit a home run. And Chrysler hit a home run for Michigan. Most multi-national companies based in the United States are spending their enormous profits on creating jobs in foreign countries. Chrysler is zigging while the others zag. Chrysler is pointing out that Detroit already has the best minds and best infrastructure to create the best and coolest automobiles. There are no mom and pop automobile companies. If Chrysler stops trying then Chrysler dies. And if Chrysler dies then it won’t get replaced by a startup – the economic barriers to entry now are too great. It is in the best interest of everybody (in the United States) for Chrysler to keep trying. It appears Republicans don't like the ad or Mr. Mathers. Here's a more lengthy treatise on my thoughts about this commercial. "Nostalgia" was my off-the-cuff placeholder for what is better termed as the exploitation of the romanticism associated with being an underdog, or "rust-ploitation." It's a positive start and many millions observed the message it projected. I'm hoping it will start another fire in this country, one of understanding that you don't put out with water. I could be wrong, but I think most people appreciate the ad for Detroit, more than the content of the ad (ie, the Chrysler car). I know I certainly won't buy a Chrysler, but I still appreciate the ad. Some are disgusted by the money spent on this ad by a company that has been bailed out. I'd like to move on. The bail out sucked. But can we stop griping about it? It's not going to change anything. Let's move on and promote cities like Detroit and Flint. There are still many people there who need that promotion. And I feel focusing on the past only hurts them. Silver City, I know you've contributed to Gordie's site before and have had some positive input but you're just wrong on this one. It's the attitude that you have that really annoys me about people when it comes to their descriptions of and attitudes toward the Flint and Detroit areas. You and others act as if you cross some random city line that you're entering some lower rung of society that includes people who need to be scolded because they are so pathetic. "What do we need to quit apologizing for?" I'll tell you what. We need to quit apologizing for living in Flint and Detroit period. They are two cities with the lowest costs-of-living in the country. They both have world-class facilities when it comes to libraries, community colleges, universities and museums. How much does a house cost in the city you currently reside? Compare that to what it costs in Flint or Detroit. I think someone just starting out would be smart to move into either one of these cities until they could get a leg up. And once they've been here I'm pretty sure they would see there is another side to these cities and wouldn't want to leave. Is there crime? Yep. Are there drugs? Yep. Are there other bad things in these cities? Yep. I got news for you, all the same ills we have your city has as well. They just don't get publicized as much. If you seek out bad things you will find them. But if you seek out good things you will find them too. That's what made the Chrysler commercial so great. It didn't make excuses it just showed a little pride. It reminded me of the t-shirt at Flint City T-shirts that reads, "Flint, Michigan...the toughest city in the world since 1855." Respectfully, thesilvercity, you are "using" this ad. 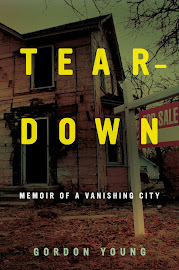 It is a fantastically honest depiction of Detroit, moving and gritty. You are advancing some arguments that may be overreaching (here's one: "will likely be foreign-owned"...you can't "apologize in advance" if the unverifiable assertion lies behind you). For the record, I'm nearly done with Naomi Klein's The Shock Doctrine--i.e., I get it, I'm on board. But there's some powerful symbolism and urban beauty in this ad that I don't think even Chrysler gets. It's just a commercial (and I've watched it a hundred times since Sunday) but it made me proud. As Detroit goes, so does Flint and I want to see all of us make a comeback. Almost every site I visit daily is talking about this Super Bowl spot. Where is the large colonial house that is shown in the spot? It's not Eminem's house in Manchester Estates, as I asked someone who has seen it. Mark Steyn is being excoriated by Frank Beckmann on WJR about Steyn's negative reaction to this spot and his tirade about Detroit. It is very true that most people's attitudes toward Flint and Detroit are shaped by media misconceptions. People that visit are surprised by the good parts of both areas. That said, I still think we need someone better tnan Eminem to promote Michigan. I was especially touched and fired up with the line in the commercial about stories being written by people who had never been here. I have fought that fight myself. I had a friend of mine refer to Detroit as a "hole" when describing airports and cities. I thought to myself he probably has never been to Detroit. To tell you the truth I feel safer in Detroit than I did in Philly or parts of DC. "I still think we need someone better tnan Eminem to promote Michigan." I'm not an apologist for Mr. Mathers' personal shortcomings. Universally, though, human societies tend to cut some extra behavioral slack for those among them with the highest artistic abilities. We can't really define art, but our societies behave as if we want it around, even when individual artists have personal shortcomings. Which is one reason why artists make effective spokespersons. Another reason of course is that sometimes they have a subtle grasp of the intersection between drama and message. I think Eminem here was an *excellent* pitchman. His choice was especially apt because of the synergism with his well known strong feelings about the D.
That is so true about feeling safer in Flint and Detroit than in other cities. This is my second comment so I'll try to keep this one shorter, but I've been around the country a little bit as well and I've come to the same conclusion. DC, outside of the monuments and museums areas, isn't all that great and I went to Atlanta and visited the Sweet Auburn area where Martin Luther King lived and preached and found it was similar. There was a nice visitors center in the new church but outside of his tomb and old Ebenezer Baptist Church the area didn't look any better than Flint. Cincinnati and Cleveland are both a mess as well, so I'm not really sure why Flint and Detroit get singled out so much other than for people's ignorance and need to put others down. "...need to put others down"
Yep, agreed. One of the several reasons that racism has existed is a common human need to assuage our common, deep-rooted feelings of insecurity and mediocrity by designating a distinguishable class of humans as inferior to our class. That works geographically, too...with the advantage that racism is widely disapproved among intelligent people these days, whereas geographism is still completely acceptable in polite company. Though Bob Seger is probably considered too old to be a spokesman, I think Kid Rock would have been a better choice. Neither have been in much trouble, publicly at least. I think the ad is fantastic - it's tough, it's honest, and it sparks hope. It depicts a past, present and future, and it instills pride. I agree with a lot of what some you said above, so I won't repeat anything here, but I do want to add that I think Eminem was the right choice. He grew up in Detroit, came from fairly rough circumstances, and has worked hard to get where he is. Kid Rock? He grew up in a rural area on an orchard north of Detroit. This is not at all a criticism; it just wouldn't make sense. Besides, he's all about a good time party atmosphere - not that that's a bad thing -but his is the wrong audience, in my opinion. Finally, while Kid Rock's certainly got broad appeal, the ad is more authentic with someone who, like Detroit, and like the ad says, has been to hell and back. I think Eminem fits that bill. One other thing that just occurred to me: I'm not so sure Kid Rock's outspoken support for the Republican Party really gels with the images of muscle and sweat used in the ad to show what and who built the city. But again - that's just an opinion.